Trojan Remover aids in the removal of Malware - Trojan Horses, Worms, Adware, Spyware - when standard anti-virus software either fails to detect them or fails to effectively eliminate them. Standard antivirus programs are good at detecting this Malware, but not always good at effectively removing it. Completely clean your computer of all these invasive threats! Your computer will be clean and will run alot faster - Your Privacy will be Protected! ...... and passwords. Spyware has the power to install more parasites on your computer without your consent. Everything you do and everything you type is being recorded right now! Companies know what your interests are! Hackers will access your PC and do anything they wish. They can even steal your Identity and You would never be the wiser! Qweas is providing links to Loaris Trojan Remover 1.2.5.2 as a courtesy, and makes no representations regarding Loaris Trojan Remover or any other applications or any information related thereto. Any questions, complaints or claims regarding this application Loaris Trojan Remover 1.2.5.2 must be directed to the appropriate software vendor. 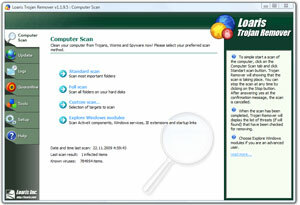 You may click the publisher link of Loaris Trojan Remover on the top of this page to get more details about the vendor.